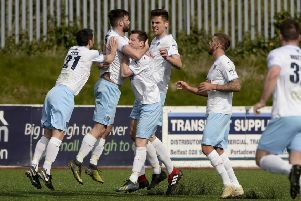 Ballymena United will step up their pre-season preparations this week. AFter no match at the weekend due to the Twelfth holiday period, Glenn Ferguson’s side will embark on a gruelling schedule of three matches inside six days this week. That starts with a trip to Lisbrun Distillery this Thursday night, followed by a visit to another Championship One side, Bangor, on Saturday. Those games will help sharpen United’s players’ fitness ahead of their meeting with a Glasgow Rangers XI in golakeeper Dwayne Nelson’s testimonial match on Tuesday, July 21. Meanwhile, Matthew Shevlin warmed up for his Milk Cup exploits with County Antrim later this month by scoring twice to salvage a 3-3 draw with Moyola Park in their latest pre-season game. Shevlin, who has already carved his name in the club’s history books by becoming the club’s youngest scorer last season, scored twice as a sub after United had trailed 3-1 to the Championship Two side.